In addition to the obvious difference in vertical scale, a critical item that would argue against even a major remodel is the orientation of the chimney. In this case they don't match. But the far right end of the porch is almost identical. . .! That is true.. It does look dead on. That was the ONLY thing that really got me to think it could be a Wright home. 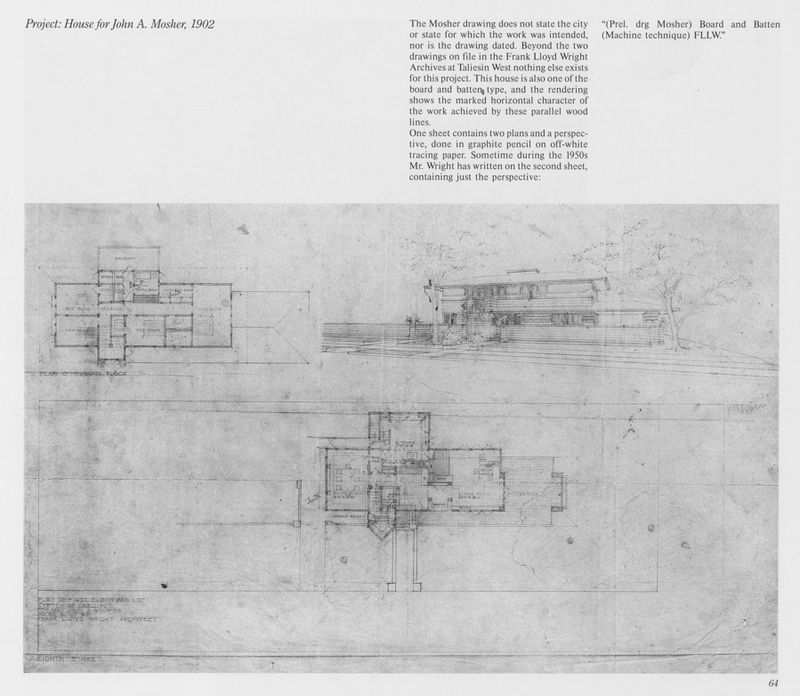 I have no knowledge of this house, but I have to ask the questions...have construction drawings surfaced from Taliesin?...What was published in the Monograph..were they just preliminary designs which inevitably changed ? How does the as-built condition compare with the construction drawings? Could this be a design that was so monkeyed with after it left Taliesin (by the owner, contractor, and subsequent owners), that Storrer's "geometric analysis" didn't come up with Wright as the author? It sounded as if Storrer reluctantly included the house when BBP put it in the Monograph. 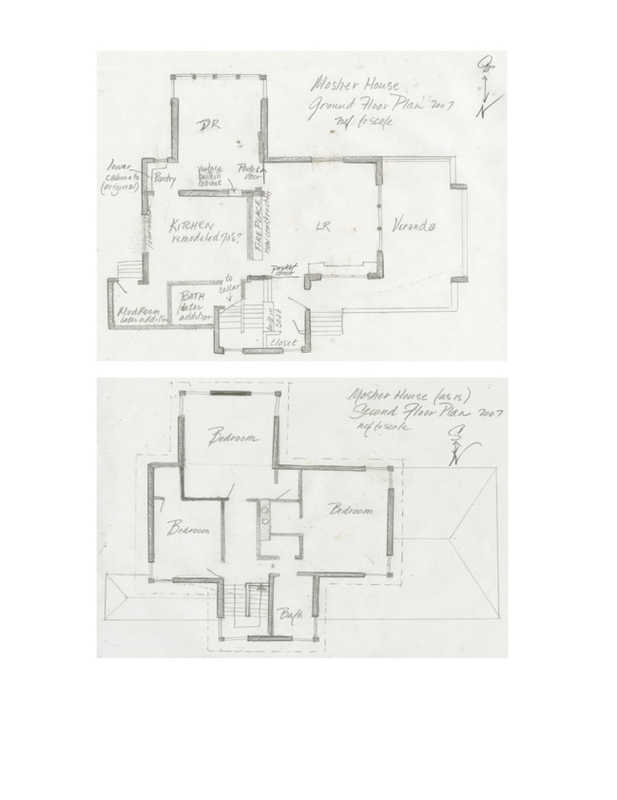 The Monograph page shows one drawing sheet with perspective drawing, ground and second story plans. I will send it to SDR with some quick drawings of mine. Please don�t laugh at my simple un-measured drawings of the existing plans. Yes, DRN, the Wright design was "monkeyed" with either by Mosher, a design engineer and inventor, or the builders. There are no existing plans outside of Taliesin Archives (how they survived the fire is unknown) and no record of alterations. Wellington was a wealthy town of large Victorian homes and smaller worker housing. The Mosher house was the home of the inventor (he continued to take out patents) but was for tax purposes gentleman poultry farmer in the census. The house was built in 1904; the following year the property tax rose. The Moshers lived there until 1918. The interior was severely altered at construction and also rudely remodeled some time before the mid- 40s when most of the cabinets & any built-ins were removed, then again in the 60s. A later owner and resident for 38 years remembers seeing them being torn out. The house was built long before electricity and indoor plumbing that far from the city, so I can not tell if the kitchen location is original but I assume that the country preference would have been eastern windows for the morning warmth resulting in the orientation change. The perspective drawing shows the front fa�ade to be east- now it faces north. The house length has been truncated. There is no foyer fireplace and the living room fireplace was replaced by a 60�s stone faced wall and a standard wood mantel. The dining room now faces south over an exposed basement with a door. The landscape never had the walls either or the buggy drive. To understand what the Mosher House could have been, review the Lake Delevan Wisconsin, houses like Spenser and Ross from the same year. me that the broad roof overhangs, and a respectable architectural order and symmetry, remain evident after these amateur (?) machinations ! documentation, if you ask me. . . I note that the majority of windows on all elevations of the house have crisp black-striped window sills. What do you make of those ? Thanks Palli, for your forensic analysis...it does clear up a lot for me. Your plans were just fine to my eye. Other than the board and batten details, the porch, and well, not much else, this house seems to be little more than a Wright inspired or derived design built for a Wright client instead of the Wright design. I believe if there was no tie to Wright via Mr. Mosher and we all looked at this same design, we would call it a Prairie-esque design, but would be quick to point out how un-Wrightian it is. 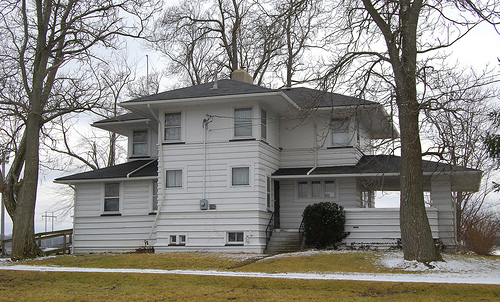 I find it hard to understand why Storrer has accepted the as built Mosher house as a Wright design, yet he casts aside the Moe house in Gary, IN, which is documented as a project in Wright's office, completed by his employees. The Moe house has more in common with Wright's Charles Brown house than the as-built Mosher house has with its own original design. Yes, it is strange...the Moe House seems much better documented. I�ve been told Storrer earlier had Mosher attribution Wright. Perhaps the recent re-instatement was influenced by that fact. I do wish that the energy spent on attribution of houses during this productive, prolific but difficult period of his life would reflect and emphasize the significance the workplace had in Wright's life. The generative camaraderie among architects at the Steinway Hall studios, the excitement of sharing of ideas, the generous aid of other architects and developers to keep him afloat as he figured out his life. (I would have loved to walk those halls watching the art and engineering happen.) Only with that firm grounding in the group effort as "profession" could Wright come to the personal recognition that he needed to explore new ideas...that the Prairie School vocabulary was not his singular voice- however individual and critical his efforts were to the development of the style. terminus -- that I find jarring in the photo of Moe that Storrer presents. their contributing details, for him. clientele) that it was more than mere "art" which excused and explained all the departures from normal practice that were found in his work. when banks backed away from the prospect of a Frank Lloyd Wright design. imagined benefits of the "product" while minimizing potential faults or compromises. that I liked -- spoiled perhaps only by having windows and doors cut into them. If I could have eliminated openings I might have been happier still. . ."
remains with us as an essential marker of the architectural experience when we have gone back out into the ordinary world -- isn't it ? slightly embarrassed when we use the term Prairie Style ? Or do I speak only for myself when I confess any discomfort at speaking "against Wright"
and "for" a "Wright style". . .? SDR- Your dialogue is very logical and the idea of intervening history helped me clarify the looseness of my thinking into a simpler thought. To speak directly to style, this is how I see it: there is a Frank Lloyd Wright Organic Architecture style- but the originators of a style don't do style. Others do style with more or less individual understanding and vision. I think that is why he wanted his ideas to be associated with the broader term Organic Architecture. Organic Architecture lives on in the work of people like E. Fay Jones. But is only a Prairie School style living now? Indeed, isn't there a Usonian style and wasn't there a first and last Usonian. Without a doubt, Wright was the principle architectural innovator within that community of architects. Unlike Picasso in painting, whose brilliance was the clear synthesis of every visual "wave length" he was exposed to, Wright was the originator of architectural wave lengths. A lessor artist would have remained the leader of the Prairie School Movement. I think, Wright saw that the urban client's expectations for architecture were well met by his friends (some would say rivals but that is to harsh a fiction) and their interpretations of Prairie School ideas. He knew he needed more challenge (an important component of play), more personal identity and, I believe, more Nature. This was the crucial point of change in Wright�s career and, like most humans, he muddled through the transition. The building to represent his new life was a few years away. When he is ready it happens- the Taliesin stone walls rise from his home hillside as if the turf itself had been cut away to expose the natural state of the rock layers. Much later, Fallingwater becomes the full statement of Organic Architecture. Like most architecture it is a work for a client, but one capable of accepting the full measure of Wright's challenge and consequence with Nature. As another aside, I find myself in this perf work required to use the word Taliesin to identify the supervised work of Wright, as it was the Taliesin School of Architecture. Some of the messiness about style comes from that. architecture, for some reason) -- helps sort out the thinking as well as the semantics, perhaps ? with" a subject, or a trope, sooner or later, and become restless to try something different ? Had he "done all that can be done" with the Prairie.. .
yes, Style. . .after an intense decade and a hundred variations ? of bits and pieces spanning a thousand years of building tradition, with a few modernisms sprinkled into the mix ? Ditto the Imperial, and Midway: broader and grander, articulated-masonry Prairie ? Better to wait for the California work to represent the complete break into something new. . .no ? I too use (of, from or by) Taliesin to mean anything issuing from Taliesin, likely not in Wright's hand but with his approval. . .